The weather seems to be a common topic of discussion, especially when temperatures rise or drop unexpectedly. At times, normal patterns fluctuate dramatically or severe abnormalities appear and disrupt our daily plans or previously scheduled events. Weather effects our immediate reality. More often the two-way conversations we create in our minds and eventually share with others come from overactive mental thoughts about imagined scenarios. These endless mind movies feature replays of past incidents, current problems or fictitious future plots. Most recently we have experienced near record rain levels producing minor flooding, dangerous driving conditions which created countless dialogues with neighbors, store clerks and telephone discourses. The lesson to remember from observing our prevailing weather is to totally focus on moments in front of us and give full attention to people we meet and the details of our daily tasks. The end results produce more optimistic selections for our consideration. 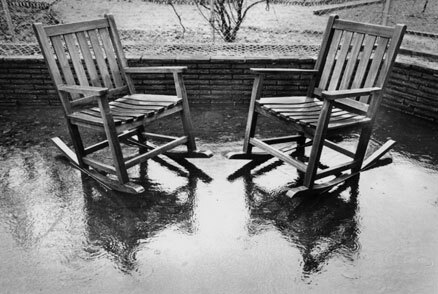 We can pray the rain will stop today, so we can sit in the chairs in our unflooded patio tomorrow.